You may remember the publishing of my English book “Top 100 Diversified Undervalued Indian Stocks for FY 2017-2018", and this book is currently available to read on the Kindle App on the Android device and in paperback format. Now, the key aspects of the book and its performance will be explained to the readers through the blog. Let's now brief you with the contents of the book. 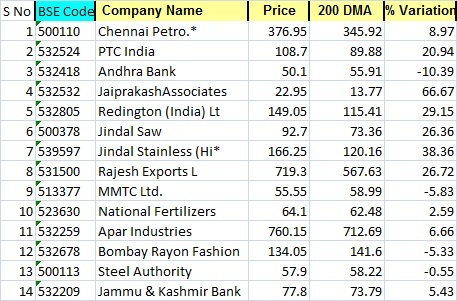 I have selected 100 out of 500 companies with the highest market cap in the market of India, whose shares are high NSPS ( Net sales per share), but according to the price, in their sector, they have the lowest share ratio of Price / Net Sales. Thus, it has an index of 100 companies from 100 diversified sectors along with their brief description whose market price/net sale per share ratio is minimum and are also amongst 500 companies have the highest market cap in Indian stock market. Now, after buying this book, you find that I have told three different methods of investing. 1. If you are a long term investor and have lot's of money for investment and you don’t mind little fluctuations and drops in the share prices and your aim for an investment tenure of 3 -5 years, the first method suits best for you. 2. The second method is for the medium-term investors who want to invest for 1 to 3 years. 3. The third way is for small investors who check the price of their shares regularly, and they feel worried when stock price fall. They want to invest for a short term period like one month to 3 months. As I have said earlier, The complete Book is not being provided here so for detailed information and guidance you will need to shell out Rs. 199. Most of my followers have already purchased the book and if you are here for the first time, then you need to read the complete book. My advice to new followers is not to purchase the book in haste; it has no magic wand to make you a millionaire overnight. Follow the blog regularly, and if you feel it's worth it, then you may purchase the Part-2 of the book next year. In this series, I will explain to you practical and real examples how Seema Kaushik has created a risk-free diversified portfolio after reading my book. Seema Kaushik is my wife who is a Housewife and falls under the third category of above mentioned three types of investors. Whether you call herself a long-term investor, I know that most investors are short term only when they get trapped in the stock turbulence they call themselves long-term investors to calm their nervous souls. Therefore Seema Kaushik is a small investor and wants to invest in shares without making losses and for shorter durations. She planned to invest after reading my book "Top 100 Diversified Undervalued Indian Stocks For FY 2017-2018" in the same way as the book states. As per the book, small investors should choose one share every week for investing. This share is from the given list of 100 shares. Investor starts from Rank#1 stock and that stock must be traded 5% to 15% above from his 200 DMA. An amount of Rs. 6400 should be invested in each stock. Then this stock is to be held until it either gets 20% profit or till the shares fall below 5% of the 200 days moving average. That means we will either book 20 percent profit or if the stock closes 5% below from its 200-day moving average, then selling it temporarily, and withdraw the remaining cash. After this temporary selling wait for the share again rise to a level of 5 percent from the 200-day moving average, then we purchase the same No. of shares which had been sold. If you have not understood this, then keep following the forthcoming parts of this article keenly, then you will understand everything. 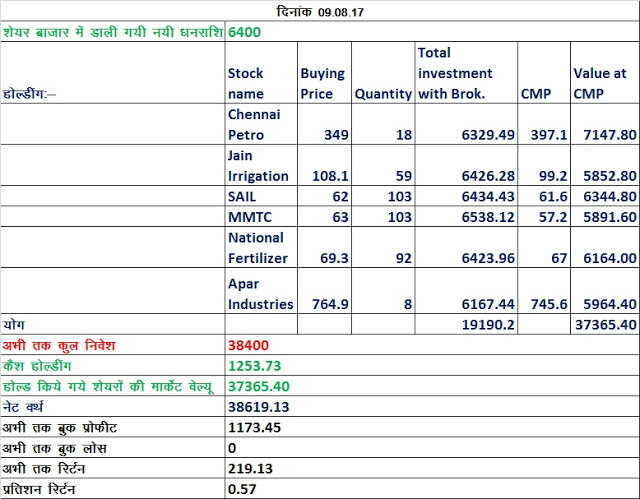 Overall Seema invests Rs 6329.49 as is shown in the book. You have to invest only in one stock per week. Seema will invest every Wednesday or Thursday. On next Wednesday she would be checking 200 DMA of Share ranked No. 2 in my book, if that is 5 to 15 percent more then she will purchase the Rank No. 2 share. Else will check Rank 3 in the share list, if it doesn't fit well, she would move to rank 4 and so on, but will invest in only 1 share per week. A question may have arisen in your mind, Being a housewife where does my wife, Seema gets her capital for investment? Do I lend my money to her? No. She is a Housewife, but she runs a Youtube channel named as "Seema ki Rasoi" she gets enough of capital money for investments through advertisements on her Channel. Now, in the comments, please don't ask details for earning money through YouTube channels. You can see videos related to it on YouTube, and you will learn how to generate income from ads on YouTube. And if you like it, you may subscribe to it. 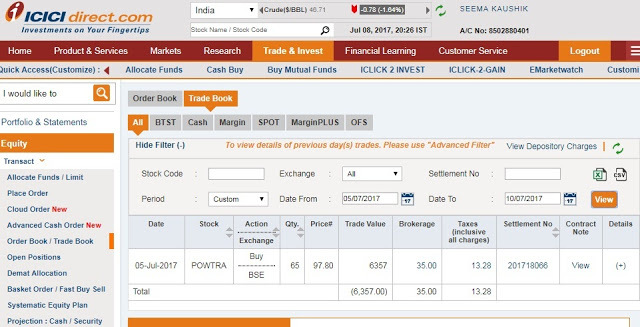 Seema checked share ranked no.2 “PTC India Ltd. “ on 5th July 2017, which as per the guidelines are given in the book was trading 15% above 200 DMA. As it told in the book, if a share is trading at 5% to 15% above its 200 DMA it is wise to invest in it. 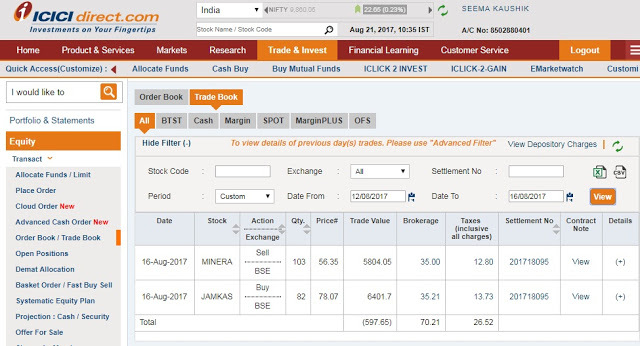 Let us look at Seema’s balance sheet at the end of trading day on 5th July 2017. 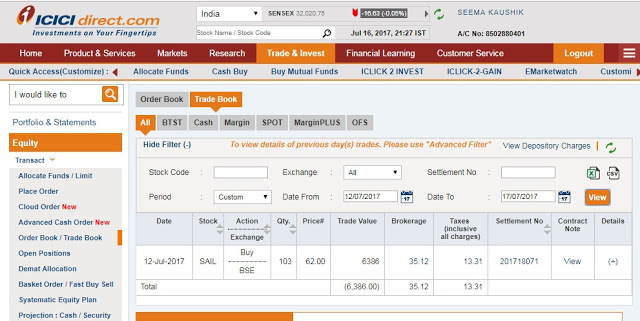 Its 12th July 2017, Wednesday and Seema Kaushik started with checking 200 DMA of shares ranked 3, and so on, the shares were already trading at 15% or more above 200 DMA. As it has been told in the book that we should not purchase those shares which are already trading at 15% and above their 200 DMA we won’t purchase it either as it is likely to go down, therefore we will buy only those shares trading at 5% to 15% above 200 DMA. To learn more about this method, it is recommended to the readers to read my book” How Chandu earned and Chinki lost Money in the Stock Market.” It’s available on Amazon , Flipkart, Paytm e.t.c. As instructed in the Book, after comparing rank wise, only one share has to be purchased which is trading between 5% to 15% above 200 DMA, Seema Kaushik purchased 103 shares priced at Rs. 62 of SAIL . You may look at screenshot proof and see the genuineness of this investment education series based on real Story. Next week Seema will check again the shares ranked 3 to 12 and if they would be trading at more than 5 to 15%, she will not purchase it and move to next 10 shares to check them. The first being, in the above book, I have told three methods of stock investing. Seema is the third type of small investor, for which 20 percent of the profits are listed as the rule of sale because only Rs 1 to 2 lakh in such small investor market And they do not have to invest new funds due to investing back the money received from selling shares. This means that no new amount will be added in the share Market this week, the new shares will be purchased from the money obtained by PTC India's shares sale which means that the money will be invested in the other stock, increasing the chances of earning from those shares as well. He ate 4 to 5 chapatis, his hunger was satiated, but then came the greed, he thought as he is paying 70 Rupees, he should eat more and also eat for dinner in the same amount of money, even then he was not content and asked for 1 roti more for the next days share. Just midway through his last roti, he started vomiting, and all what he had eaten came out. Everyone sitting there looking at him with contempt and he got an earful from the restaurant owner. Everyone was laughing at him when he came out after paying 70. Due to over eating he had a stomachache and had to shell out another 200 as Fees for the doctor. To add to his woes, he had to eat porridge for the next day. The similar thing happens to those in greed in the share market. Thus when profit is optimum, it is better to sell the shares when the time is right. The market may be on a high and on a bull run, you may not understand the moral of the story right now, but when a few small investors face trouble as Ghishubhai did, then not only you will remember this story but also understand the moral of the story. So, Seema sold 65 shares of PTC India at 117.50 rupees to the tune of 1173.45 rupees. The price of 65 shares was Rs 6405.28 including brokerage price of 97.80 and the amount received from the sale was 7637.50 less Brokerage 42.00 + Tax 16.77 = 58.77 on the amount of Rs 7578.73, and thus the total profit was 1173.45 rupees. 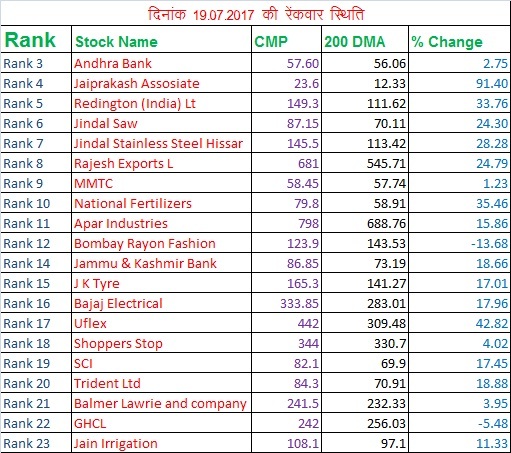 After this, on Wednesday 19.07.17, the rank of Jain Irrigation ranked at 23 was found in the range of 5% to 15% above its 200 DMA after checking from Rank 3 to 12 and from 14 to 23. 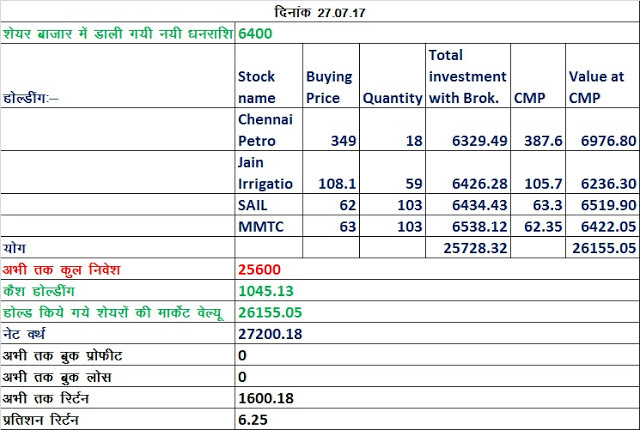 At the end of trading at 19.07.2017 the balance sheet of Seema. This week, Seema Kaushik did not purchase the shares on Wednesday, because we live in Sirohi district of Rajasthan where due to continued heavy rains Internet and power supply was cut so we could not buy the shares on Wednesday. One of my inquisitive readers had asked that the Seema sold shares of PTC India, if the shares drop down to a lower price then should we buy it again? My answer is No, we won't as my book has 100 shares listed in it and this year we will purchase only from them, and if PTC India again features in the next edition of my book during 2018-19 and falls under the rank, then we will purchase it. It means that next year, we will start afresh with a clean slate with Rank 1.If we would be holding some shares at that time, then we won’t purchase them, and if we have already booked some profit on the particular share and it falls in the purchase range, we will surely buy it again. I hope you are enriching your financial investment knowledge. See you again next week, Keep watching how small investments made per week and profits booked on every 20 percent profit is a way to invest safely in the stock market. Small investors are afraid of the stock market, It has been six weeks, where are the losses? When there will be a fall in the market or if a share closes at 5% below its 200 DMA, we will sell it and start reverse trading, i.e. when the same share gains and is trading at more than 5% above its 200 DMA, we will purchase the share in equal amount as we had sold earlier. Chennai Petroleum is going to give a dividend of Rs 21 per share on August 14, 2017, so even if we make a profit of 20 per cent till August 14, 2017, then we have to trade it wisely so that we can enjoy dividend and also keep the profits safe. Learn more about this next week. Also, many of my Followers and those who have purchased the said book have demanded that I should provide excel sheet of all the shares mentioned in the book so that they can update the daily price and 200 DMA directly into it, I am providing the link to download the excel sheets below, it is password protected and only those who have purchased the book shall be able to open it. The password to this file is the BSE code of the share ranked 100 in my book. Password: - Enter the BSE Code of Rank 100 in the Book. We were assured and relaxed because the prices of shares in the market do not always follow the rules, so there is a possibility that we can get even 20% profit, and even if we don't the reverse trading technique has made us fearless of this situation. Some readers may find this condition panicking, but now it is only 1.75 months. It’s the beginning. I will tell you the story of Chennai Petroleum which we purchased at 349 a share. If we had booked a profit at 418.80, it would have been a profit of 20% which further went high to 422 and on 8th August went up till 424, but as it was about to give a dividend of Rs. 21 on 14th August we held back these shares in greed. We thought that after getting a dividend of Rs. 21 per share even if goes down till 400, we will be in profit. Share market doesn't always behave the way we anticipate. It fell down to 374 and we had to be content on the dividend of Rs. 21 per share only. We will have to hold this till it reaches 20% profit again. However wise one is, he will eat like Ghishubhai one day, you have read about Ghishubhai in previous posts, you may go back to read it again and refresh the moral of the story. One more important information, many readers wanted to know how Housewives can earn money through Youtube Channel. The stock price of Jain Irrigation closed at 91.95 on August 10 this week. As its 200 DMA was around 97 on August 10, and on Jain irrigation trading below 5% of 200 DMA we had to reverse trade it. More information about the reverse trading system is available in my books," The Winning Theory In Stock Market" and "How Chandu Earned And Chinki Lost In The Stock Market”, If you haven't read it yet, I would give you a brief overview. We will sell this share and book a loss but his loss is not real loss as we will keep a watch on this share keenly and if share doesn't fall further and it closes above 5% of DMA, we will purchase it again i.e. we purchased this share on 18th July 2017 at 108.10 and sold it at 91.50 and obtained our cash. Currently the DMA of the share is around 97, if share closes at 5% above its 200 DMA, i.e., around 102, we will buy our 59 shares again. The loss incurred in this process will be Rs.688.90. Let's see the calculations. 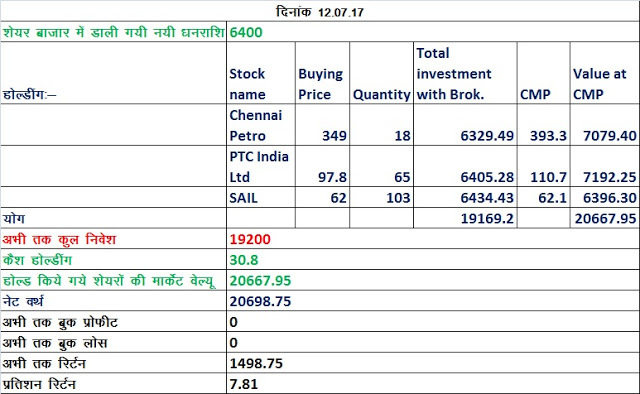 59 shares purchased at 102 rupees = 6018; Brokerage 48 ,New investment of 6066.
in this way by an investment of 6066.00-5377.91 =688.09 we get back our 59 shares, that too when our estimate goes wrong and this share goes further high. Normally its found that only 5 out of 20 shares after going below 5% of DMA,rises up to 5% above 200 DMA in a quick time. 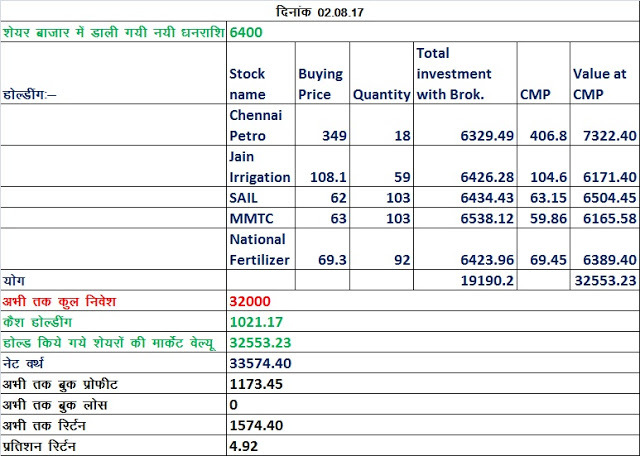 The share of Pratibha Industries was sold by me this year a year ago. Till now it has not gained above 5% of its 200 DMA and has been falling from Rs 26 till today. It has come to Rs 8, and its 200 DMA also decreases to Rs. 11 You may have realized that in such a situation if the share of Pratibha Industries is bought back by me, it will be a winning situation for me as I had sold the shares in the reverse trading system and to buy back the same shares I will have to spend half the money I obtained by selling it. 1. First of all, we will not be worried seeing the prices of shares in our portfolio fall daily. 2.If we keep the money we get back, in the savings saving account, we get 3.5 percent annual interest, however, we can make an FD at 6.75% interest rate for a principal of Rs.50,000 in ICICI Bank, on monthly interest, we will get a monthly interest of Rs. 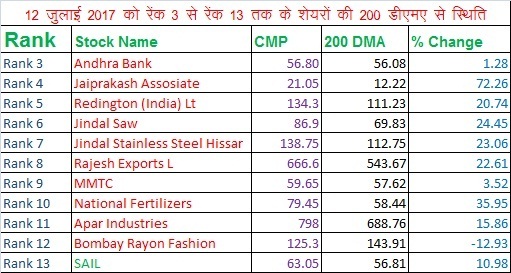 250 per month which in comparison to shares like Pratibha industries is a better option as will compensate the losses just with the Interest gained. 3. When shares starts increasing, we can buy back the shares at a much lower price than the purchase price. 4.The biggest advantage is that when we sell a stock by holding less than a year then we have to pay a 15 percent income tax on it, as my wife earned a profit of around Rs.1100 by selling shares of PTC India she had to pay income tax at 15 percent rate amounting to Rs.165. The loss incurred in reverse trading i.e. 6426.28-5377.91=1048.37 may be subtracted from the profit , i.e. from the profit gained of 1100 we can reduce the loss incurred of amount 1048 in reverse trading system and will have to pay 15% Income tax on NET profit i.e. 1100-1048=52. We booked a loss of 1048.37 by selling shares of Jain Irrigation on 11th August. Also, MMTC shares closed at5 percent below its 200 DMA, so we sold it in reverse trading system and thus did not have to put in more money to purchase shares for this week. This week on 14 August 2017, it was the record date of Chennai Petroleum's Dividend, which means now we will get a dividend of Rs 21 per share, amounting to 378 on 18 shares.It is showed in the balance sheet below. 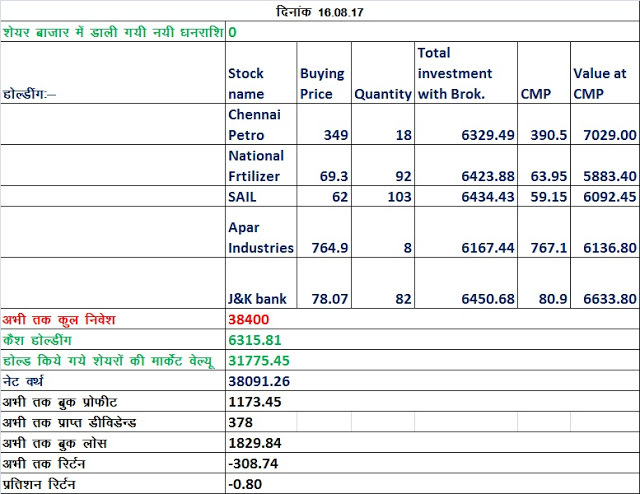 The balance sheet dated 16.08.2017 shows cash obtained by reverse trading and by dividend is included in cash holding and subsequently invested in shares of Jammu and Kashmir Bank. Therefore there was no need for putting in more money for investment. Next Part of this story will publish soon.